DIY - Valentine Bows fundraiser! This works well for groups of people who know each other e.g. schools, church, social clubs. 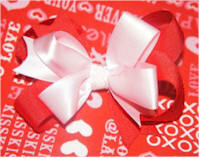 Sell red (love), pink (like) and white (friendship) bows with a message. Use card stock (business card size) for personalized and anonymous messages attach desired color of bow with pin – we sold them for $1.00 each, raised over $350 in 4 hours. Each person can “send” as many messages as they want and the recipients get to wear the bows. Great for the ego! How to do it : 1. Have the sender write their name (if they want to); the recipient’s name; brief message and attach bow. 2) The organizers of the event distribute all bows and messages (i.e. cupid) 3) Recipient receives bow and message, wears bow, keeps message. Feels warm and fuzzy. You make money. Submitted by Daniela L.